So like most first time moms I wanted to make Evelyn's first birthday extra special. That for me included making her a special princess birthday cake. I searched the internet and found a great recipe then I found an amazing decoration idea using fondant to make a crown. I had never worked with fondant but according to the directions it looked pretty easy. So I went and bought all of the supplies and the night before her big 1st birthday party I began baking. Well to say the least, it did not turn out. It was an absolute mess. The fondant was so hard to work with and the sugar free, healthy cake I made her tasted terrible. I was so disappointed. We still ended up using the cake and it has has been a funny memory. 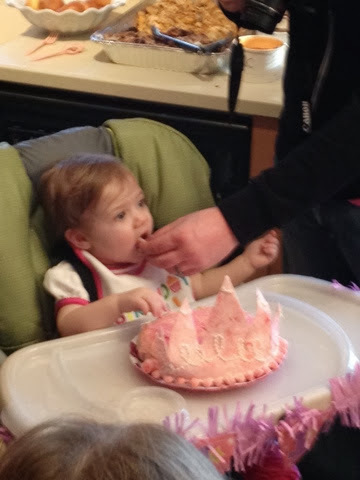 For her 2nd birthday I bought a cake and it was so good and it was decorated perfectly. This year for her 3rd birthday I am going to attempt to bake again, we'll kind of. I'm going to be making cupcakes out of the box and make my moms homemade buttercream frosting. 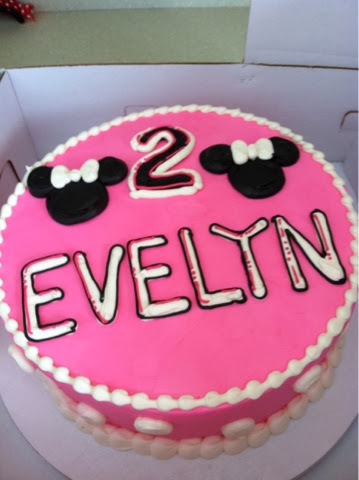 I'm leaving Evelyn's personal cake in the hands of professional bakers. She wants another princess cake and she has lots of ideas. I'm ordering it today so I'll update you on how it turns out. For memory's sake, let's take a look back at year 1's cake. Year 2 I had it made. And this year I'm having a small personnel cake made and I'm baking cupcakes. The buttercream frosting is so good and easy to make. First, beat together cream cheese and butter until it's well combined. Then add in vanilla. Then start adding sugar a half cup at a time. I used about 3 cups maybe a bit more. Splash in some milk thin in it out. Then fold in the food coloring. 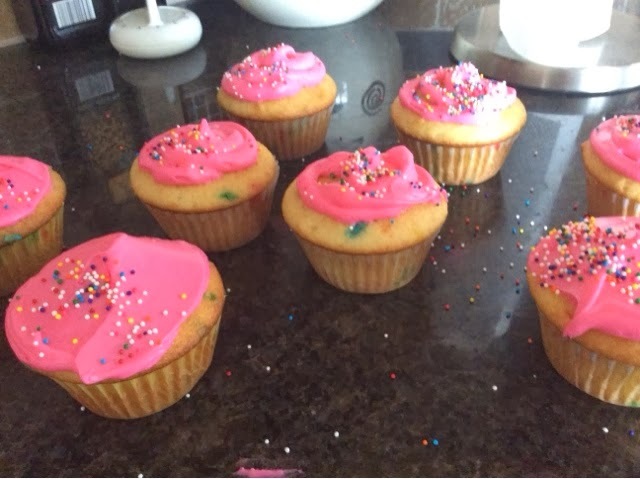 I tested it on some cupcakes to make sure I could get the right color. It worked great. I used Wilton food gel. Pink.